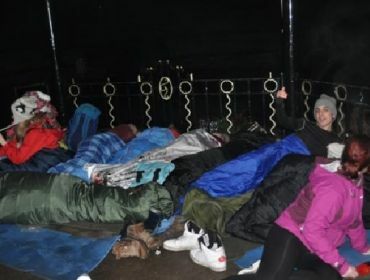 On Friday 16th November, over 30 young people of Rhondda Cynon Taff and over 15 RCT Detached Youth Workers and Services For Young People staff members, took part in a charity Sleepout Challenge in Ynysangharad Park, Pontypridd, in aid of Shelter Cymru. Shelter Cymru is a charity based all over Wales that raises money and awareness for the homeless in Wales by doing events such as the Sleepout Challenge. 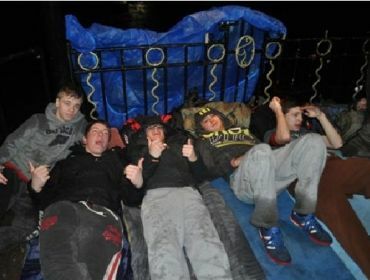 The challenge was to sleep rough in Ynysangharad Park for 12 hours – starting at 7pm Friday night all the way through to 7am Saturday Morning. 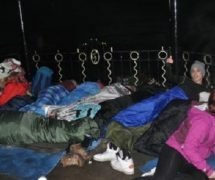 All the young people were well prepared for the cold and rainy night by wearing plenty of layers and bringing sleeping bags, pillows and even hot water bottles. Young people and their Detached Youth Workers started to arrive at 6.30pm at the main entrance of the park. 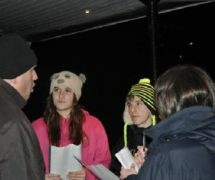 The young people came in groups from Tonypandy, Tonyrefail and Aberdare to raise awareness of the homeless. At 7pm we all set camp in the park’s bandstand and as it was pouring down with rain we had to put plastic bags and towels on the fence to stop our heads from getting wet during the night. Sarah Evans, one of the Detached Youth Team started the night with a game, which involved us all having to untangle ourselves while holding hands with the opposite person. After the warm up game, we all started to talk to each other a lot more and make new friends. 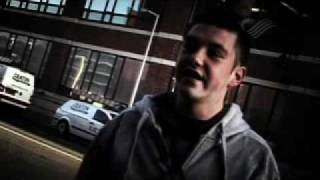 Wicid: Hi Andrew, is it possible we can ask you a few questions on behalf of SFYP and WICID.TV? Wicid: Have you ever taken part in an event like this before? 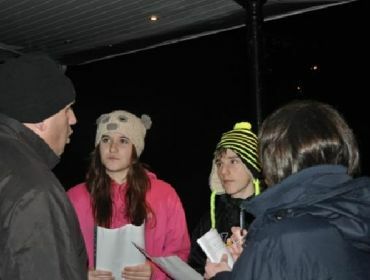 Andrew: Yes, I have taken part in about 20 and tried to attend as many as possible, this event was my idea to set up to highlight how many people sleep rough in RCT and also an event like this emphasises the broad range of people who sleep rough. 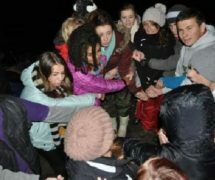 Wicid: Do you think when running this event for young people of RCT, would it help the young people support and help the homeless in the future? Andrew: I hope it does, but everyone will have different awareness about sleeping rough and an event like this also helps put different views about homeless people than before. Wicid: Do you think the Sleepout Challenge is a good idea to raise money and awareness for the homeless? Andrew: I really enjoyed putting this challenge together and it is important for me to be with you. I wanted to be here to support all young people and staff members in doing the Sleepout Challenge. Wicid: Are you looking forward to the Sleepout Challenge tonight? Andrew: Yes, I am looking forward to tonight and I think it is a fantastic idea! There are loads of charities out there but you have to find the effort to help the charities close to your heart. Wicid: Do you know anyone that is homeless, or has been homeless in the past? Andrew: Yes, I go around many schools and it is surprising how many teachers have been homeless when they were at university as they had problems with student housing, property owners and rent payments. There is also a successful Welsh artist called Karl Davies who was homeless and he now supports Shelter Cymru because he was homeless at one point. Wicid: Have you ever spoken to or helped a homeless person? Andrew: Yes, but before I joined Shelter Cymru I had very little idea what help was available and how many people were affected. I have seen from a personal perspective what life is like including university trouble with student housing problems. Wicid: Have you ever given food or money to a homeless person? Andrew: I have never I given food but I have bought the Big Issue magazine. There is a great deal of people sleeping rough and a lot of them have health problems such as mental health, epilepsy, diabetes and asthma. Also with homeless people who have mental health problems I would support them by signposting them to the right help and advice centres or organisations. Wicid: Would you do a Sleepout Challenge again? Andrew: Yes, but it would be better if the young people, volunteers and community want to do it rather than being told to do it. There is so much good work being done, people often look for the bad things when there is many good things going on. Wicid: Thanks for your time and letting us interview you for SFYP and WICID.TV. Andrew: No problems at all, enjoy the night. After the interview with Andrew, we all had hot drinks to help keep us warm. At 10pm we all nagged the staff members to take us down the park as we were bored and we spent an hour playing in the park like big kids on the swings and slides. It had been 5 hours since we started the challenge and we were all getting hungry so it was time for some soup. Rachel and Allyn from Detached spent over 3 hours cooking the soup that was vegetable soup with bread and it was fantastic. After the soup some of us tried to get to sleep but when one of the Tonypandy boys was sleep walking around the bandstand that got everyone scared as they thought it was some stranger! 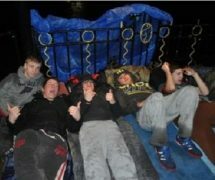 As 2.30am struck, the entire Duke of Edinburgh group were all flat out sleeping like a bunch of sausages in a frying pan. It was now 4am, we were hungry again, and it was time for the second soup run with a nice cup of hot drink. We were all filled up now and ready for a game of Switch with our cards. We played cards for about 2 hours, to pass the time. With 1 hour left of the challenge it was time to start packing away all our sleeping bags and pillows ready for the move back to our lovely beds. 7am came and everyone looked so shattered they could not stand up for 5 minutes as Sarah thanked and congratulated everyone for completing the full 12-hour challenge. While everyone was packing up I spoke to some young people to see what they thought of the challenge. 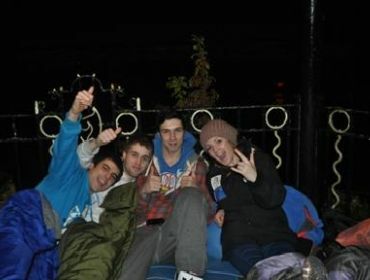 Brandon from Tonyrefail Cluster said, “The sleepout challenge was fun and really enjoyable, I also made some new friends and I really hope I can do it again but in the warmer weather”. 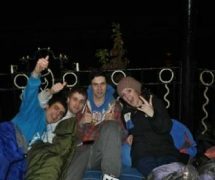 I really enjoyed the challenge and I’m looking forward to the next Sleepout Challenge!